Get relief from dry eye with help from eye care specialist in the Philadelphia area . 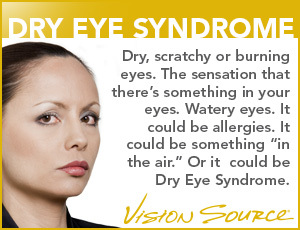 Dry eye is a common eye condition that affects both eye health and vision. As the name implies, dry eye is a lack of tears in quantity or quality. Burning, itching, grittiness, redness, and irritation are just a few symptoms. Conditions may be mild and temporary or stubborn and long term. There are many treatment options for dry eyes, from lifestyle changes, to eye drops, to surgery. Learn more below and contact a trusted eye care provider. Find an office near you in the Philadelphia area. Tears are far more than just saline solution. They are a complex mixture of water, fatty oils, and mucus that both protect and nourish the eyes. While the symptoms of dry eye are universal, there are many specific causes, each with a different treatment plan. Some are temporary, like dry environments, windy locations, or smoky air. But many are medically based and long lasting and include inflammation of the eye tissue, underlying medical conditions, side effects of drugs or surgery, contact use or body changes due to hormones or aging. Dry eye is a very common medical condition that can sometimes be difficult to treat. While over the counter tear drops may help in mild cases, moderate to severe cases often need advanced or custom solutions. The first step is diagnosis through a comprehensive eye exam that will evaluate tear production and eye health. Treatments include ways to replace tears, improve tear longevity and quality, or manage underlying conditions causing dry eye. Generally there are medicines, eye drops, treatments and procedures. One important thing to note is that there are custom options for people who can't find relief from conventional treatments. Eye doctors may prescribe certain medicines to help reduce inflammation or help stimulate tears. And certain medical solutions can be applied directly to the eye to provide time-released relief or help controlling inflammation. There are even custom eye drops for people who don’t find relief with conventional options. There are many advanced medical procedures that include closing tear ducts to reduce tear loss or conversely unplugging clogged tear ducts to improve flow. Optometrists can even prescribe special contact lenses that compensate for lost moisture. Treatments to unblock oil glands with medical devices or even warm compresses may also bring relief.